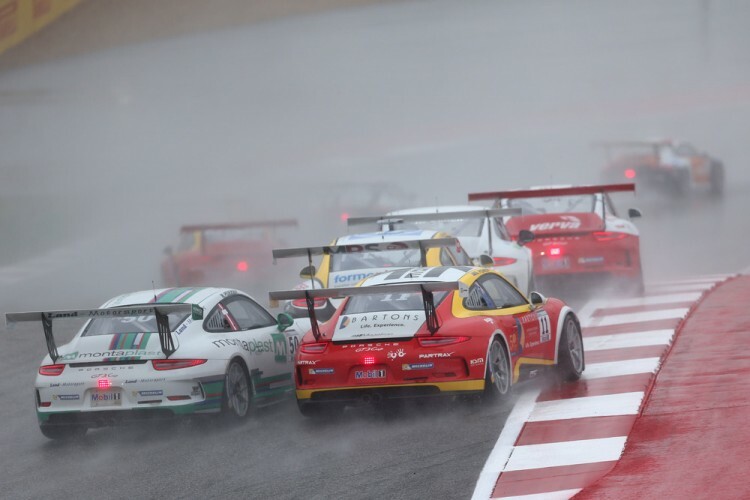 The 2015 Porsche Mobil1 Supercup once again proved to be one of the hardest fought and most spectacular of single-make GT competitions. Across ten (of eleven planned) races, it was Philipp Eng who stood apart from his rivals to claim a deserved Supercup success for Team Project 1. The Austrian stood on the rostrum across fifty percent of the races held, with two wins from Silverstone and the second Spa-Francorchamps encounter. Yet arguably it was Lechner Racing Middle East man Sven Müller who was the emergent star of the season. Müller first stood on the podium at the Hungaroring where he claimed victory. Once on the rostrum, he wasn’t removed for the rest of the season. His second half results sheet post Hungary reads: Spa: 1st and 2nd, Monza: 1st and 1st and Circuit of the Americas: 3rd. One more podium than the eventual champion and double the race victories means you can put a case together for Müller perhaps deserving a little more than he got from 2015. That isn’t a difficult case to break though. At the Circuit de Catalunya Eng was off the podium but fourth, Müller was off the podium and off the road. Then in Monaco and at the Red Bull Ring, Eng was second and then finished first. Müller barely scraped two tenth places. Then Eng won at Silverstone and Müller retired. It was already game over, even when from Monza through Austin Eng only achieved one sixth, one seventh and one eighth placed finish and Müller claimed two wins and a third. Final difference: 145 plays 126. Third in the standings was claimed by another member of the Lechner fraternity, Michael Ammermüller. Ammermüller claimed victory in Spain, a third at Silverstone, two thirds at Monza and second in Austin. He finished two points adrift of his teammate and his only non-finish was a spectacular and mechanical induced roll at Spa. Lacked the out and out pace of his rivals. Britain’s Ben Barker finished inside the championship top ten, ninth overall for MOMO-Megatron Team PARTRAX with the highlight of his year being a deserved Monaco podium. His part time teammate Cameron Twynham had a more difficult year. Twynham scored a best result of twelfth in Spain and then exited post Hungary after struggling to find form in the tricky Type 991 machine. Other performances of note came from Fach Auto Tech drivers Jaap van Lagen and Christopher Zöchling. Van Lagen came in for a one-off drive in Monaco and claimed victory, later season appearances not garnering success worthy of note. Zöchling came in for the Red Bull Ring round and claimed victory before eventually finishing sixth in the championship standings. The Heart of Racing by Lechner had a reason to cheer in America when Alex Riberas delivered on his long promised form with a fantastic first Supercup success. Martinet by Alméras youngster Côme Ledogar claimed his debut series podium in Hungary, ditto Team Project 1’s feisty Italian Matteo Cairoli at Monza. Cairoli occasionally showed a hot headed and aggressive side and this got him into trouble at Spa, when first lap over exuberance ruined his and Ledogar’s second races. The pair finished seventh and eighth in the end of year standings, the Italian two points up on the Frenchman. Cairoli was fast if erratic. (Credit: Porsche AG). Christian Engelhart (MRS- GT Racing) was always there or thereabouts and finished fourth overall come season’s end but we have got up to this point without mentioning the Porsche veteran simply due to a lack of standout success. A trio of thirds kept him in the game and consistency meant he finished a respectable twenty-five points off the summit. So after another all action season in the Porsche Mobil1 Supercup, Philipp Eng stands tall as the latest victor of Porsche’s premier category. Where he will progress to now, remains to be seen. From a personal perspective, to see the young Austrian remain in the Supercup and defend his crown would be fascinating. Now, more than ever in the history of the championship, there appears to be a new breed of young GT driver, the Cairolis, Ledogars and Müllers of this world. To see how the new king of the castle would fight off such upstarts could make 2016 even more enticing a prospect than it currently looks set to be.